Some of the between thirty and eighty thousand people (depending on the source of the estimation) marching in the streets of Dublin Saturday waved Greek flags in a gesture of solidarity with those hit hard by austerity measures there. 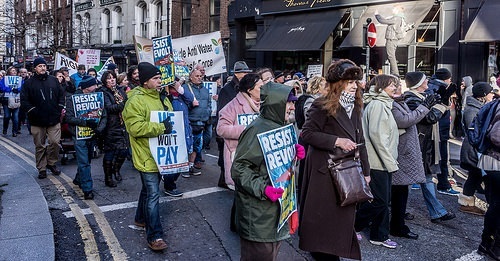 Indeed, there was an undercurrent present of the uneven nature of the recovery in Ireland (as in the U.S.) but this demonstration was specifically focused on the government’s scheme to begin to charge residents for water. It was the fourth large demonstration on the issue since October.